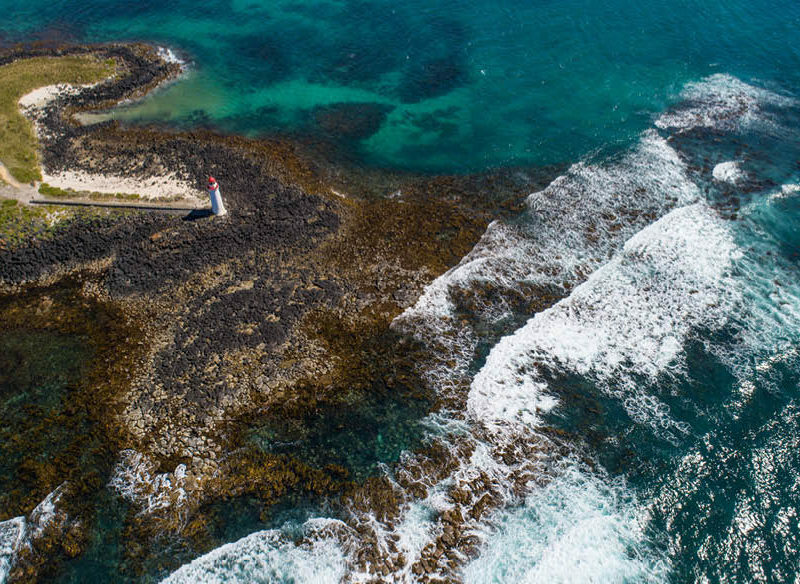 Birds eye view above the Port Fairy foreshore. As we drive the three-hour inland route from Melbourne airport to Warrnambool, on Victoria’s south coast, my husband and I note the sprawling acreage and lush greenery that lines the freeway and it feels like a suitably relaxing start to the journey. Upon arriving at the Best Western Olde Maritime Motor Inn, we meet the owner and our host, Raj, a lovely guy hailing from the UK who managed to go from humble hotel employee to owner in just a few short years. Raj’s sense of pride towards Warrnambool is unmistakable as he speaks to us over dinner at the inn’s signature restaurant, Clovelly. He opens up about starting a new life in the small Australian town he’d never heard of with his new Australian bride – and how it has been a wonderful place to raise a family. I get the sense that Warrnambool has the type of community you want to be a part of, the kind where you can rely on your neighbour to bring in your mail when you’re away. It felt comforting, and a little like being on the set of Neighbours. The next 48 hours are a wonderful, marvellous blur in which we see some of the most naturally beautiful vistas we’ve ever clapped eyes on, learn more about the history of Australia than we did in any classroom, and eat some of the most supremely beautiful produce available. As we wander across the road from our Best Western apartment to Flagstaff Hill, we are thankful that our destination is so close on such a brisk evening. Being so close to the south coast of the country, Warrnambool can certainly catch a breeze in the wintertime; beanies advised. After a short wait in the gift shop we are ushered downstairs, through a corridor with hanging panels, which in an instant comes to life with the face of a fisherman from the 19th century. He tells us about the ghosts of the Shipwreck Coast, right here in Warrnambool, and that we are in for quite a tale. We then make our way down to the Flagstaff Hill village, which, for all intents and purposes resembles a fully functioning township from the 19th century. During the day, the blacksmith and various stores are roaring with life, but at night it’s less about the village – and all about the Sound and Light show. The multi-million dollar experience takes audiences back through time to visit the Shipwreck Coast when whale oil was one of the most precious commodities a man could come across, and many died in a bid to get it. Careful of the moving set, you won’t see the wobbles and splashes coming, but they’ll happen. Beachfront at Warrnambool, at the iconic location where the movie ‘Oddball’ was filmed. The shining gem of the Best Western Olde Maritime Motor Inn, Clovelly, is the sophisticated dining offering for guests and locals alike. Hotel owner, and our host, Raj chats with locals as they sit down to dine with their families, in an elegant and soothing space. I wrestle over the menu, eventually settling on the Surf ‘n’ Turf, and am subsequently treated to some of the most satisfying prawns and sumptuous steak I’ve ever had. My only regret? Not asking for more of that sauce. The wines we sample with dinner are also of a high quality, the shiraz a standout, especially with the steak. However, for a usual non-dessert eater, I throw caution to the wind and order the sticky date pudding. Well, it may just be one of the best decisions I make throughout the whole trip – potentially in the last few months. And what I missed by way of sauce with the steak, I more than make up for in the form of butterscotch gooey golden syrup. I’m not drooling, you are. Yep, in 2012 humble Port Fairy was voted the world’s most liveable community of towns with a population of under 20,000. The accolade was awarded by the UN-recognised LivCom Awards and it took everyone a little by surprise. Though, perhaps it shouldn’t. The quaint seaside town feels like the type of place you might have holidayed with your family as a child, which makes for a feeling of calm of nostalgia as you wander its streets. It has a certain ‘way back when’ feel about it, probably due to the stores, which despite keeping up with the times, have also maintained a degree of small-town charm. The cosy local cafes, ice-cream parlour and clothes and shoes boutique If the Shoe Fits & Isabella’s, are a few standout options. Cuter than Christmas. Bay of Islands Coastal Park, Warrnambool. 4. Get some whale watching in – hopefully! Winter is an incredible time to see the whales on the south coast of Victoria. As they migrate down ‘whale corridor’, the region from Warrnambool to Portland, you can often catch a glimpse from one of the many lookout spots scattered along the coast, however the best place is Warrnambool’s ‘whale nursery’. The strip received its name because during the winter months whales from the Antarctic make the journey to warmer waters along this coast, in order to breed, birth and nurse their young. In early July we are probably just a few weeks premature, with the prime time for whale-spotting being mid-July to August. ‘The Grotto’, located just out of Warrnambool, along the Great Ocean Road. On our first full day in Warrnambool, we are introduced to a man called Bob, who Raj assures us knows everything there is to know about this magical place. Bob has raised his family in the town, and worked as the principal of the local high school. He now runs local tours for residents and tourists – and is even booked solid for large groups until November. Bob is the kind of guy you just want to sit down with over a cup of tea and listen to. His passion for Warrnambool is contagious and the glint in his eye as he ferries us around to some of the most naturally awe-inspiring landscapes I’ve ever seen shows me just how pure his passion is. The Bay of Islands Coastal Park takes a little walking from Bob’s humble Southwest Explorer bus, but once we make it to the cliff face, the view is just phenomenal. Some of the most miraculously formed cliff edges make you feel as though you are standing on the edge of the world. However, the best sight we were to see that day was yet to come. Bob instructs us down a path, that after weaving through some intense foliage, ushers us down a sand bank to find a completely isolated secret beach – one of Bob’s favourites – with what looks like two of the 12 Apostles lurching out of the sea. It is truly one of the grandest views I’d ever seen. 6. Good luck getting into the caravan park, guys. During our tour, Bob also takes us down by the sea to an area that’s alive in summer, filled with families who stay for weeks on end, either in the caravan parks of the seaside accommodations. I clap eyes on the paddle boats on the small river and the putt putt golf range and am exclaiming to my husband how much I’d love to bring our future children here when I am interrupted by a laugh. Raj says that the big problem with the BIG4 Warrnambool Figtree Holiday Park is that out-of-towners can rarely get in, because the locals who live just 500 metres up the road all shuffle down for summer. It seems life is so good down here, they’ve got no reason to leave!